Imagine planning an event and being able to see and experience every inch of how your space will look that day, just by slipping on a pair of goggles. This is the future that virtual reality promises. For the clients of designers, developers, and event producers it means a more dynamic buying experience. While the technology continues to evolve, the foundation for VR is well established in current 3D renderings. 3D renderings, though not as immersive as VR technology, provide an incredible opportunity for agencies like ours to illustrate exactly what we’re trying to accomplish for our clients. When MediaCutlet designs a layout for an event like a trade show, a conference, or a performance, everything starts with a vision. Traditionally, that vision gets translated onto a two-dimensional blueprint or drawing, leaving the client to imagine what certain elements will actually look like in the three-dimensional world. What we can now do, instead, is create a 3D sketch of the event space and digitally add and rearrange things to appear as they will day-of. From here, the client can zoom in, change perspectives, click around the 3D model, and essentially take a virtual tour of their event, long before it ever happens. For example, a specific section of the sketch can show you exactly what the event stage will look like from the front row of the audience. Suddenly, it becomes a lot easier to answer clients’ questions and help them truly visualize how the event will look and feel. 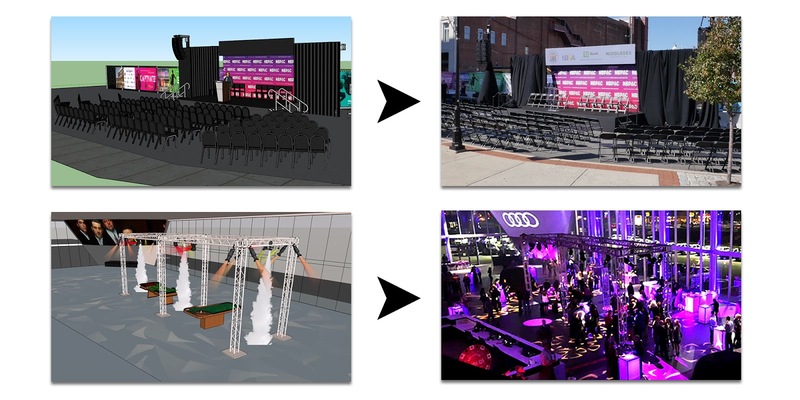 We recently worked on an outdoor event with the New Brunswick Performing Arts Center where a 3D model helped us establish a floor plan for seating, a space for the band, event signage, and more – all in the middle of a busy New Brunswick intersection. Our 3D rendering helped everyone involved understand the layout down to the inch. The sketch even made it all the way to the mayor’s office when he signed off on street permits. As VR technology becomes more accessible and affordable, we see an opportunity to take the client experience a step further. Rather than simply seeing screenshots of our 3D renderings on a computer screen, we can bring everything into first-person view. With a pair of VR goggles, the client can occupy the perspective of someone experiencing this space in person. This can be incredibly impactful, especially if they’re re-envisioning a space they see every day through this VR lens. We’re still a few years away from the average business or consumer owning a full virtual reality system and headset, but in the meantime, there’s a lot of bridge technology that can bring a VR rendering to life. Google’s inexpensive Cardboard VR viewers allow anyone to use their smartphone for virtual reality experiences, and as VR headsets become more affordable and portable, more and more agencies will begin to explore the possibilities of this technology. MediaCutlet aims to be at the forefront of the VR movement (we’ve got an HTC Vive in our office), especially in an industry where images are so much more powerful than the written word. With our current 3D and future VR models, we can deliver that “end result” visualization, right from the beginning.